Memphis may primarily be known as the home of the blues, but it has been and continues to be a mecca for all kinds of musicians. These museums show, tell and sing the story of how Memphis became music central. Opened in spring 2015, the Blues Hall of Fame makes a great start to your magical music tour. Photos, signed guitars, books, clothes, show posters and albums sweep you along the blues’ journey from cotton fields to concert stages. Touch screens in each of the 10 galleries showcase featured artists through images, films, text and music. Two private listening nooks play your requests from every era. Stick with a favorite or jump from Big Mama Thornton’s “Hound Dog” one second to Stevie Ray Vaughan’s “Pride and Joy” the next. The Memphis Music Hall of Fame Museum is also new and full of listening stations. A touch screen points you to current Memphis standouts, so you can plan who you want to watch perform live while you’re in town. Bold lighting and décor choices--like a piano suspended from the ceiling--set a unique tone. Like the Blues Hall of Fame, the Memphis Music Hall of Fame annually inducts new members, so exhibits are always changing to honor both the city’s musical roots and performers on the contemporary scene. The Stax Museum of American Soul Music tells the incredible story of how a tiny record store in an old movie theatre became one of the most important recording studios in the world. When Stax Records opened in 1959, it began cranking out a massive catalog of smash soul hits by the likes of Isaac Hayes, Otis Redding, the Staple Singers, Wilson Pickett, Luther Ingram, Albert King, the Bar-Kays, Booker T. & the MG's, Johnnie Taylor, Rufus and Carla Thomas. The museum has a dance floor built into the exhibit space, with a loop of “Soul Train” episodes airing nearby for inspiration. If listening to all of this music has you inspired to create some of your own, then head down to Gibson Guitar. The legendary brand has been perfecting the art of guitar-crafting in some form since 1902, and their Memphis factory offers tours that let you see how much time and effort goes into craft each instrument. The 45-minute tours will fascinate even the most musically-challenged and give you a greater appreciation for the rock and blues music you’ll hear throughout the city. Authentic instruments and iconic costumes are just a part of what makes the Memphis Rock ’n’ Soul Museum such a great place to learn about the city’s musical roots. It provides an in-depth look into what caused the explosion of music at Sun, Stax and Hi Records in Memphis, and features seven galleries, three audio-visual displays, and tons more. The self-guided audio tour lets you go at your own pace and spend extra time jamming out to your favorite artists. Question: where can you see the place where Johnny Cash, Jerry Lee Lewis, B.B. King, Roy Orbison, and The King himself, Elvis Presley, all made music? Answer: Sun Studio. Sun Records released the first-ever rock ’n’ roll song ("Rocket 88" by Jackie Brenston and His Delta Cats, for the uninitiated) and continued to make waves as some of history’s greatest artists recorded music here. The lively tour delves into the studio’s illustrious and colorful history with tons of anecdotes and artifacts. 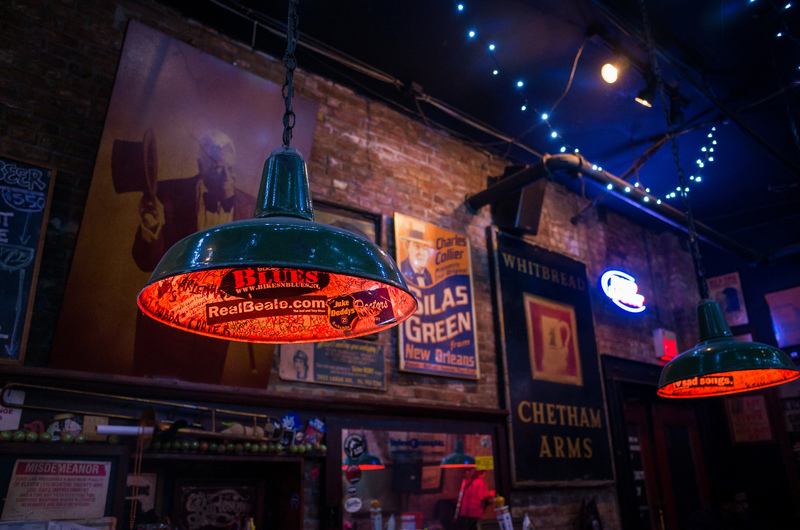 Learn about music by experiencing it first hand at BB King’s Blues Club on Memphis’s famed Beale Street. This is the original location, and it serves up mouth-watering barbecue and live blues and rock music every night of the week. After you’ve enjoyed your meal, stick around to drink and dance the night away!